It’s a well-known fact that proper oral hygiene is vital for humans; but, many pet owners aren’t aware that maintaining the oral health of their dogs is just as important. Regular brushing helps to promote stronger, healthier teeth. It also helps to eliminate bad breath. In other words, brushing your pup’s teeth is a must. Of course, in order to brush your best friend’s teeth, you’re going to need the right toothbrush for the job. There are a lot of dog toothbrushes on the market, so find the best option can be a difficult task. To help you make the best decision, we’ve assembled a team of experts, including veterinarians and professional groomers to help us review dozens of dog toothbrushes. Our assessments have allowed us to narrow down the five best toothbrushes for dogs. Now that you’ve seen our picks for the best toothbrushes for dogs, let’s take a closer look at each one. Below, we offer a detailed review of each option. We share what we like about them and what other users have said. After reading through the reviews, once you’ve found the best dog toothbrush for your needs, click on the buttons to find the best prices on Chewy and Amazon. First up on our list of the best toothbrushes for dogs is Rosy Life’s Pet Dog Soft Toothbrush. This set comes with two different types of brushes for your pup: four soft finger toothbrushes and four long handled toothbrushes with two heads. The long handled toothbrushes feature soft bristles and have a slim design, so you can easily access those hard to reach teeth. The head on one end is larger and ideal for a medium or large breed dog, such as a German Shepherd, a St Bernard, or a Rhodesian Ridgeback. The head on the opposite end of each of the brushes is a smaller size; perfect for smaller pups, such as a West Highland White Terrier, a Bichon Frise, or a Dachsund. The handles are textured, allowing for a better grip and more control. The finger toothbrushes are made of silicone and fit comfortably on any finger. Since they sit right on your finger, you’ll have ultimate control while brushing your furry friend’s teeth. The set is backed by a satisfaction guarantee. The texture handles on the long-handled toothbrushes don’t really do much for grip. Some users have said that the toothbrushes could be more durable. Final Verdict: Overall, we were pleased with the Rosy Life Pet Dog Soft Toothbrush. We like that it comes with two different types of toothbrushes, and that there are four of each type of toothbrush. We also like that the long-handled toothbrushes feature dual heads, so you can use them on dogs of all sizes. We do agree, however, that they could be a bit more durable. 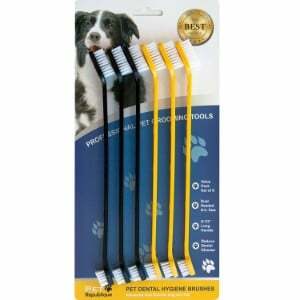 If you’re looking for finger toothbrushes, H&H Pets Professional Dog Toothbrush is a great option to consider. Available in two sizes – a four pack or an 8 pack – you’ll have plenty of toothbrushes to keep your canine companion’s teeth fresh and clean for a while. The opening on each of the toothbrushes is ¾ of an inch in diameter and have a slightly curved design. You can easily fit your finger inside, but don’t have to worry about it slipping off. Also, the curved design allows you to clean those tough to reach spots with ease. Made of FDA-approved food grate materials and featuring soft nylon bristles, you can have confidence knowing that your pet won’t be harmed when you brush his teeth with H&H Pet Professional Dog Toothbrushes. These brushes are scientifically designed to remove tartar and plaque buildup, which can help to minimize the risk of oral health problems. These dog toothbrushes are also backed by a 100% satisfaction guarantee; if, for any reason, you are not happy, contact the seller within 60 days of purchase and they will refund your money. The curved design prevents the toothbrushes from slipping off your finger and allows you to clean those hard to reach areas with ease. Available in packages of four or eight. Made of food grade materials that have been approved by the FDA. Nylon bristles are soft and won’t damage your pup’s gums or teeth. Backed by a satisfaction guarantee. Some users said that they were large. There were some complaints about bleeding gums. Final Verdict: If you are looking for a safe, durable, and affordable toothbrush for your pet, consider H&H Pets Professional Dog Toothbrush. They are well-designed and very effective; but, if you have a small a small pup, such as a Pomeranian or a Shih Tzu, this toothbrush may not be the best choice, as it might be too large to fit in his mouth. And, as for the complaints about bleeding gums, that’s like due to aggressive brushing; make sure you apply gentle pressure when brushing your dog’s teeth. The Pet Republique Cat and Dog Toothbrush has been named one of the best dog toothbrushes on the market by our team of experts, and by users, alike. These long-handled toothbrushes feature a dual head design; one end features a small brush and the other features a large brush. With this design, you can easily brush all corners of your pup’s mouth. These toothbrushes can also be used to brush the teeth of dogs’ of all sizes. The handles on these brushes are 8.5 inches long, which allows for easy maneuverability. The food grade materials ensure the safety of your pup, and the bristles will easily remove caked on debris without harming his teeth or gums. These toothbrushes are backed by a satisfaction guarantee. If, for any reason, you are not happy, the seller will offer you a new product or issue a full refund. Lastly, we were impressed by the generosity of Pet Republique. They donate 15 percent of their profits to the American Animal Rescue Society to help pay for the care of dogs and cats that have been abandoned. Some users said that these toothbrushes didn’t work as well as they would have like them to. Final Verdict: These toothbrushes are thoughtfully designed with two heads, so you can easily clean all the surfaces of your dog’s mouth. The package comes with 6 toothbrushes, which is a great value for the money. Make sure you exercise caution while brushing your pup’s teeth with these, and any other, toothbrushes, to avoid bleeding. 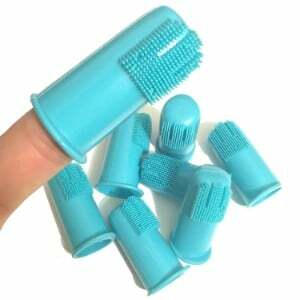 If you have several pups, you are a groomer, or you just don’t like the idea of using the same toothbrush again, than the Pro Dental Finger Brushes from Top Performance are definitely worth considering. These toothbrushes are disposable; brush your pup’s teeth once, toss the brush away, and use a brand new one for the next brushing session. The disposable nature of these toothbrushes makes them highly sanitary. They are also made of durable and safe materials, so you can have confidence knowing that your furry friend’s teeth will be well cleaned and that he won’t be harmed in any way. The bristles on each of these finger toothbrushes are designed to wipe away all types of debris, including plaque, tartar, and even food that’s stuck between his teeth. The material is soft and sized perfectly to fit on the index finger of most pet owners or groomers. Thanks to the flexibility of these toothbrushes, you can easily clean the back-most teeth of your pup to ensure excellent oral hygiene. The soft and flexible design makes them comfortable to wear and easy to use. There were some complaints about the sizing; some users said that they were too large and others said that they were too small. Some people said that they found the bristles were too hard. Final Verdict: If you’re looking for a disposable, finger toothbrush for dogs, than the Top Performance Pro Dental Finger Brushes are certainly worth a try. We found that they are easy to use and very effective; however, if your fingers are very small or large, you might have some trouble with the fit. With the Toothpaste and Toothbrush set from Ortz, you will have everything that you need to get your pup’s teeth clean. That’s because this dog toothbrush set comes with two different types of toothbrushes, as well as a high quality toothpaste. One of the dog toothbrushes in this set features a long, curved handle. 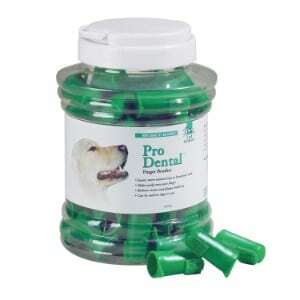 This design allows you to easily reach all of the nooks and crannies in your furry friend’s mouth. The long handled toothbrush also has two heads; one for small teeth and one for large teeth. The bristles on both heads are soft and won’t damage the surface of your pup’s teeth, or his gums. This set also comes with a finger toothbrush for dogs. It has a .75 inch expandable opening, so it can easily fit on fingers of all shapes and sizes. The silicone material is flexible for comfort, yet durable to provide a great clean. 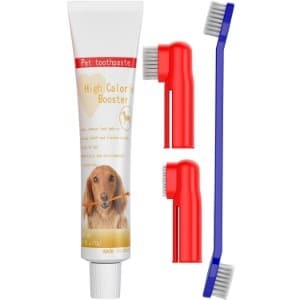 You can use the toothpaste that comes with this set, or you can any type of toothpaste for dogs; whichever option you are most comfortable with. The toothbrushes are made of high quality materials and are designed to be used on dogs of all sizes. Both types of toothbrushes are comfortable and easy to use. The bristles won’t damage your furry friend’s teeth or gums, yet they effectively remove caked on dirt and debris. The set is backed by a money back guarantee. If you aren’t happy, contact the seller and they will refund your money. There were complaints about the bristles on the toothbrushes; some people said that they were too course. These products are made in China. Final Verdict: If you’re looking for an all-in-one oral hygiene kit for your dog, than the Ortz Dog Toothpaste and Toothbrush set is a great option. 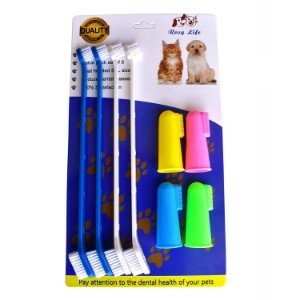 It comes with everything you need to maintain brush your four-legged family member’s teeth. However, the products are made in China, so if you’d prefer an American-made product, you might want to consider another option. As a dog owner, you want to provide your furry friend with the very best of everything. Why wouldn’t you? – He is more than just a pet; he is a member of your family! You’ve put so much time into finding and investing in the best possible products for him, including his dog crate, dog bed, dog house, and even an outdoor dog kennel and a dog playpen. You have probably even spoken to your veterinarian about dog food and carefully selected the best option to meet his nutritional needs; whether it’s dry dog food, grain free dog food, or dog food for sensitive stomachs. And of course, you have chosen the best grooming products to keep your canine companion to keep your canine companion neat, clean, and looking as dashing as possible. You bathe him with the best dog shampoo, keep his coat tidy with a high quality dog brush, and give him regular pedicures with the best nail clippers for dogs. While you put so much time and thought into caring for your pup, there’s something that you might be overlooking: brushing his teeth. Oral hygiene is as important for your pet as it is for you. If you just added a dog to your family or you are new to brushing your furry friend’s teeth, investing in the best toothbrush for dogs is essential. But there are a lot of options on the market to consider. In this portion of our review, we share information that will help you select the best dog toothbrush. We also share some tips for doggie tooth brushing. There are three main types of dog toothbrushes. In order to choose the best option to meet his needs – and yours – you first need to understand the difference between the three different types of toothbrushes. Standard toothbrushes for dogs. A standard toothbrush is very similar to the toothbrushes humans use to clean their own teeth. The design is pretty similar; they feature long handles and a head that is covered with bristles. But, there are some differences, with the most notable being the materials that the bristles are made of and the angle of the head. A standard toothbrush for dogs has softer bristles than a human toothbrush to prevent injuries, and the head is usually more angled to allow for better reach. Dual-headed toothbrushes for dogs. These toothbrushes are like standard brushes in that they have long handles; however, there are two different heads on each side of the handle. Usually, one head is smaller and narrower for small breeds and teeth, and the other head is larger and wider for larger breeds and teeth. Finger toothbrushes for dogs. As the name suggests, a finger toothbrush for dogs is designed to fit on your finger. It kind of resembles a thimble. These toothbrushes are usually made of soft, flexible material, and have short nylon bristles. Since they fit right on your finger, you can access more surfaces in your pet’s mouth. However, they are not recommended for small dogs, as it can be difficult to open their mouths as widely as needed to access their teeth. Just like you have taken the time to research and consider all of the products that you use with your pet, such as his dog collar and/or dog harness, and even his flea collar, it’s also important to fully research and consider his toothbrush. If you want to get his teeth as clean as possible, then you are going to want to invest in the best possible toothbrush to meet his needs. Type of toothbrush. Which type of toothbrush would work best for your dog and which would you be the most comfortable using. While finger toothbrushes for dogs can be extremely effective, if your dog has a small mouth, it may not be ideal for him. And, even if your pup has a large mouth, you might not feel comfortable using a finger toothbrush. Size of the toothbrush. Of course, you want to make sure that the toothbrush is the right size for your pup. Obviously, you don’t want to choose a large brush for a small dog, as it will cause discomfort. While a small brush might be able to fit comfortably into a large pup’s mouth, it likely won’t do an effective job. Make sure you choose the right size for your furry friend. The materials. Safety is always of utmost importance. The best toothbrushes for dogs are made of high quality, food safe materials. They also feature soft bristles to prevent injuring sensitive gum tissue and damaging the surface of his teeth. The angle of the brush. It can be hard to reach all of the surfaces of a dog’s mouth; especially the back teeth. Look for a toothbrush that has an angled head. This design will allow you to easily reach all of those corners, even the back-most teeth. Just like having the right flea treatment for dogs is essential for combating fleas and other pests, and choosing the right dog grooming clippers is necessary to ensure that his coat is well-kept, you also need to ensure that you are using the best possible toothbrush for dogs when you’re brushing his teeth. However, even if you have the best possible toothbrush, it won’t make much of a difference if you aren’t using it properly. Make sure your dog is calm before brushing. If he’s stressed or overly excited, brushing will be more challenging. Introduce the toothbrush and toothpaste to him before brushing. Doing so will allow him to become familiar with brushing and won’t make him feel anxious or afraid. Never apply too much pressure. Doing so can damage his teeth and gums. Always toothpaste that is specially formulated for dogs. Never use human toothpaste, as it can cause serious harm. Proper dental hygiene is essential for your dog. Brushing on a regular basis with the best toothbrush for dogs will strengthen his teeth and gums, freshen his breath, and reduce the chances of serious oral health problems. The last thing you want is for your dog to develop an infection or lose his teeth! By using the best possible toothbrush – such as the five listed in this review – and following the tips we offered – you can ensure your pup’s pearly whites will be healthy and clean for years to come!